Lee Duckles*, Principal Cello and soloist with the Vancouver Symphony Orchestra, received his early training in the San Francisco Bay Area. He received his degree in performance from the University of Illinois and participated in post – graduate masterclasses with cellists Mstislav Rostropovich, Janos Starker, and Harvey Shapiro. An active chamber music performer, he has appeared in music festivals in British Columbia, California, Colorado, Washington, Alaska, and South Korea. 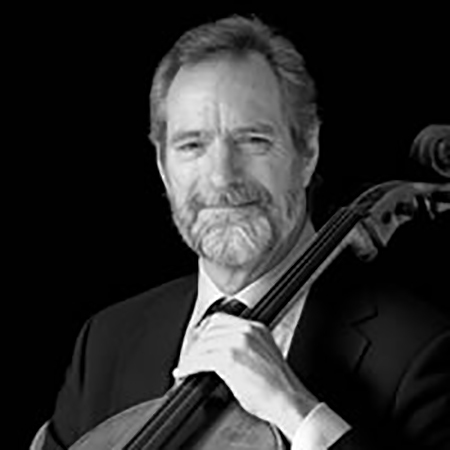 Since the 1980’s, he has been the Principal Cello at the Cabrillo Music Festival of Contemporary Music in California where he has premiered a number of works for cello and orchestra and worked with composers Aaron Copland, Hans Werner Henze, Lou Harrison, Phillip Glass, A.j. Kernis, and John Adams. In Vancouver, Mr. Duckles was a founding member of the Vancouver New Music Society, the Masterpiece Music Series, and the contemporary music ensemble “Days, Months, & Years to Come”. In addition to teaching at the VSO School, he continues an association with the Vancouver Academy of Music, the University of British Columbia, the Encore Piano Trio and the Vancouver Chamber Players. He is currently the President of the Vancouver Cello Club. Mr. Duckles has recorded for the CBC, both as performer and arranger, the Musical Heritage Society of America, Heliodor Records, and Skylark Records with the salon music ensemble, Viveza.